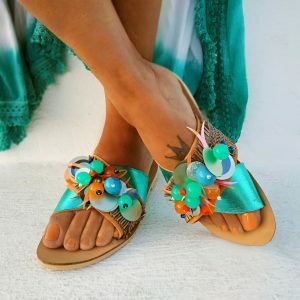 These shiny eye-catching form sandals feature soft leather straps and a cushioned foot for stylish comfort. 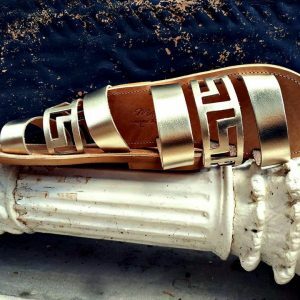 Major goddess appeal with these gold metallic Greek Ancient flat sandals. Free-spirited and eclectic . 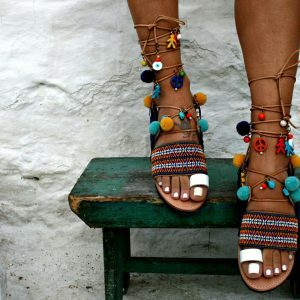 These are the words inspired us to give an exposure to this awesome boho handmade leather sandal . With a spice of another era back to time brings a unique edge to your look. Charms, tassels , poms and rose Gold leather pops off the golden luxury to this multi banded toe thong sandal. Tie the short rounded leather color in any way you love . 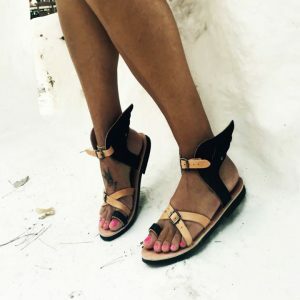 Build your new-season wardrobe from the ground up with this black n gold strappy leather pair of sandals. With a comfortable natural leather and a stud clip detailing on ankle , you can wear these all day long. Are you ready for summer holidays ?